Parameters are one of Tableau’s most powerful features. I remember when they were first introduced and it completely changed the Tableau paradigm. 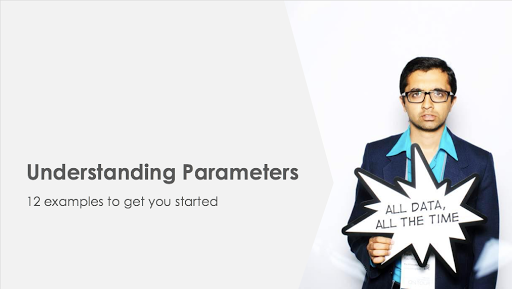 This week’s video takes you through 12 simple use cases for parameters. These 12 barely scratch the surface for what’s possible. NOTE: This video is 50 minutes long. Thank you for your sharing so much, your teaching is so good and easy to understand. I have a question related to filter and parameter as they are sometimes similar in nature, in terms of filtering. Can you explain in what circumstance that you will prefer filter over parameter. Hi Pong. The answer really is it depends. FIlters update with the data while Parameters do not. But parameters can be used more flexibly. There's no single answer to your question, I evaluate which to use on a case by case basis. Nice post Andy, great prelude to my upcoming Advanced course. Nice post, Andy. Also love that picture of Ravi. Thanks! We call that the Sad Ravi picture. Can you also please explain how to use a filter across 2 different data sources in a dashboard?